This music-based quiz title covers a wide range of music, ranging from the 60s (and earlier for a few) up to modern day tunes. The questions throughout the rounds try and reflect this wide range, aiming directly for family play with a wide range of ages accommodated for. Buzz can accommodate the usual 1-4 players or even stretch to 5-8 if you have an extra set of Buzzers. New to Buzz? Well you need to get a set of buzzers which each have a large red button for the menus and four coloured buttons to choose answers from each multiple choice question. It’s instantly accessible for anyone. There’s a vast choice of categories offered up for a player to choose between rounds: Lucky Dip, Britpop, Pop, decade specific, Number Ones, Male/Female stats, Indie, Electropop, Metal , Rock, Music Theory and many, many more. DLC packs will make an appearance further down the line too. Returning game modes include: Fastest Finger (first correct answer gets the points), High Stakes (bet points you’ll be able to answer correctly for the given category), Pie Fight (throw pies at a contestant of your choice), Stop The Clock (more points for quick answers), Point Stealer (steal points from a fellow contestant for every fastest correct answer). The final round is still the Countdown mode where your points are converted to time on a descending tower. It’s still crap. There are a few new game modes which is a relief to see as the last few games were beginning to stagnate a little. Name That Tune plays a music track for you to name, Boiling Point has contestants competing to fill a thermometer first by answering questions correctly, Tune Warp plays a distorted version of a track for you to name. Watch It plays a section of a music video and then quizzes you a few times on it to see if you can remember minor details, and finally Over the Edge, which throws a contestant into a vat of goo for too many wrong / slow answers. The answers themselves in Over the Edge only appear a letter at a time, making for some tense matches. The Buzz series desperately needed some new game modes, so it’s good to see a decent number here. You can opt for 15 minute 4 round matches or go for 30 or 45 minute ones with more rounds. Or you can have a quickfire round with 20-100 questions. Fingers crossed one of the hidden Trophies isn’t get 100/100! There are some rounds that you’ll prefer, so you can choose a custom game which will let you hand-pick the specific rounds you want. Buzz tries to please everyone of various ages and musical tastes. Inevitably this often means some questions will leave players completely baffled. But at least they can take a guess with a one in four chance of being right. Online you can choose from an epic list of quizzes designed by other players. They’re not limited to music either. You can pick from knowledge, lifestyle, music, sport and TV & movies. All of these categories have sub-categories too. 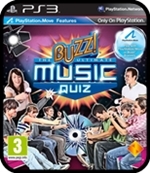 The last few Buzz games messed up by only allowing you to do one quiz at a time, you spent more time searching than playing. That’s been fixed now though as you play four rounds with a choice of nine quizzes from your sub-category available for you to choose from. All quizzes can be played by yourself, multiplayer or even online. Sofa vs Sofa matches return and are a great fit for parties as is the offline game. The improved online mode makes this a much better purchase and will extend the life of the title long after you get bored of the music questions. The overall look of the game has had a bit of an upgrade. There are a few extra characters to choose from and the in-game studio looks a lot more like a prime-time show. Even the host, Buzz looks better as he’s taller and looks a bit less like a South Park Canadian. You’ll still want to strangle him though, can somebody fire Jason Donovan already? At least an option to skip cut-scenes is available. Better still, using the PS Eye you can add your own faces to the contestants and the host, complete with scary mouth movements. The new PlayStation Move controller is getting in on the action too. You’ll only need one as the multiplayer is turn-based. The camera puts you on the screen and changes the controller into a different on-screen device for each of the four games. Hammer Time gives you a hammer to hit the correct answer to a question from one of the blocks below you. It instantly feels like a perfect fit for the Buzz series and players are less likely to select the wrong answer accidentally as they might when fiddling with the buzzers. This one would have been even better if two players were able to play together, jostling to get to an answer first. Pop Lifeturns the controller into a large dart to pop balloons with answers on them. You do it with a pointing motion rather than a throw. Interestingly you have to pop all the wrong answer balloons and avoid the correct one. Master Blaster has the answers written on the side of flying UFOs with you using a ray-gun to blast them out of the sky. A bonus round lets you quickly shoot down some gold UFOs for a few extra points. I often found that a second shot was needed as the first one wouldn’t register as a hit, but it wasn’t a game-breaker. Heavy Metal turns the controller into an ACME-style magnet as you pick up a correct answer and drop it into a metal crusher for points. All the Move modes were enjoyable and it would have been great if there were a few more available. It’s a shame they’re quite cut-off from the rest of the game too, with less customisable options available. You can’t do the online quizzes with them either. The Move compatibility may have been a late addition to the game, but it’s clearly a great addition to the series that we hope is supported more for any sequels or upcoming DLC. The Short Version: The first essential buzz game on the PS3 thanks to the extra modes. The inclusion of the PlayStation Move has worked well, but we wanted more of it! 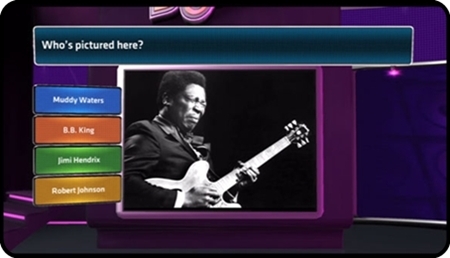 The online quiz selection is so much better now too and thankfully isn’t limited to just music, but it might not be enough to tempt non-music fans who might be waiting for a more unspecific Buzz quiz game.